In a food processor or blender, add garlic cloves, 1 tablespoon of finely chopped red onions, 1 tablespoon of finely chopped jalapeno peppers, 1/2 cup of chopped tomatoes and chopped cilantro. Squeeze in the juice of half of the lemon and half of the lime. Pulse a few times until all ingredients are combined. Add avocados and yogurt and process until smooth. In a separate bowl, add the remaining chopped tomatoes and finely chopped red onions. Squeeze in the juice of the other half of the lemon and mix. 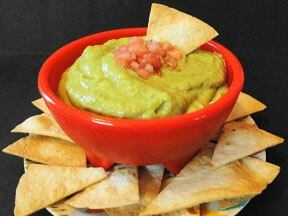 Serve as topping over avocado dip. In a small dish, add 2 tablespoons of olive oil. Squeeze in the juice of the other half of the lime into the oil and stir. With a pastry brush, paint a very light coating of the mixture on one side of each tortilla. Stack the tortillas, greased side up, in an even pile. With a sharp knife, cut the stack in half, then into quarters, then into eighths. Separate the chips and arrange them, greased side up, on a lightly oiled baking sheet. Bake in the oven for 10 minutes, or until they are crisp and beginning to lightly brown.